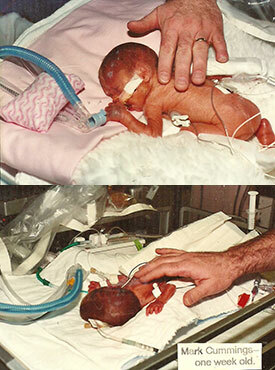 When Michael and Mark were born 3 1/2 months prematurely, no one expected they would live through the day*. But they were fighters, and despite several setbacks they came home from the hospital at 3 months old, which was 3 weeks before their due date. Yet, I soon began noticing developmental delays; and when the boys were 15-months-old, they were diagnosed with Cerebral Palsy (CP). Michael, the doctors told me, would probably have learning disabilities, and Mark would fare far worse—the best that could be anticipated for him would be learning disabilities, but most likely he would be “mentally retarded,” and neither of them would ever walk. Soon after the diagnosis, we began traditional therapy and the boys made some progress. However, despite the good intentions of those who worked with my children, I could tell that only the symptoms of CP were being treated, not the brain injury itself. As a nurse, I knew that if my little boys were to have a chance at a normal life, the root of the problem needed to be addressed. The NACD did exactly that. The boys were three years old when we began the NACD program. Deficits in sensory abilities are common in CP, and our boys were no exception. Neither one could feel things normally—they had limited feeling in some areas and hypersensitivity in others. They were also hypersensitive to sound, and loud noise and music caused them a great discomfort; they would cover their ears and cringe. So their individualized programs included targeted neurodevelopmental and sensory-motor activities which helped stimulate the development of new neural pathways. Initially, the boys’ sensory dysfunction was such that they had difficulty tolerating some of the activities; but with time they adjusted to the various forms of tactile stimulation and later even began asking for it. Eventually, Mark and Michael acquired a much more normal awareness and feeling. An example of this development is the “case of the eyelash.” One day I noticed an eyelash in Mark’s eye. It was black against white, but his eye never registered it as a foreign object. Then, several years later, Mark came in from outside rubbing his eye, his eye all red, asking me to get this “thing” out of his eye. I never did find the “thing,” as I’m sure he flushed it out with tears, but I was thrilled! His brain was finally properly processing foreign objects in his eyes. The doctors and therapists had told us that the boys would never walk and wanted them to use wheelchairs; but knowing that unused muscles atrophy, we refused the wheelchairs and worked on preparing their brains for walking. Mark was already crawling when we saw Bob, but Michael wasn’t. We began teaching the boys to crawl in a serialized pattern, and later did cross patterned walk, over and over again, with an overhead ladder. When Mark took his first independent steps across the room, I screamed with joy so loudly that I scared him! I am the first to say that this has not been an easy road. 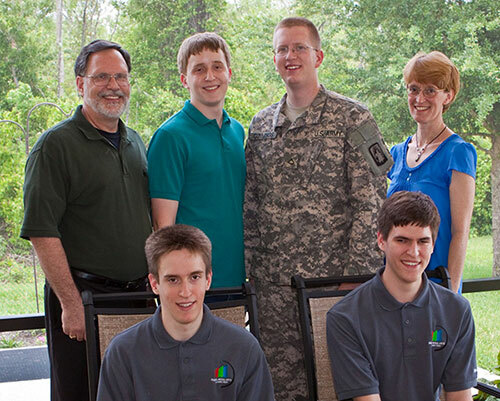 We worked on the NACD program with Michael and Mark and home-schooled all four of our boys. John was a year older and Tim was four years younger. Although our friends and relatives were generally supportive, some urged us to put the children in public school in order to get free therapy so that I wouldn’t have to work so hard. When the boys were in third grade we did just that for the purpose of me “getting a break.” I quickly realized that our goals for the boys were different than the school’s. For example, the goal of Michael’s physical therapy at the school was for him to get in and out of the wheelchair and safely maneuver through doors, not to build him up to walk. We ended up pulling the boys out of school within two months because the experience was so negative. Yet, it was an invaluable training for me. I witnessed firsthand that just because something is free does not mean that it is good. Truth was I could do more brain changing and capacity building at home in one day than the school could do in more than a week. I also saw that the school’s philosophy was to create an environment in which my children could function; but the NACD offered to change my boys and teach them how to function in any environment. And the boys changed. Even though they had identical diagnoses, their NACD programs were very distinct and highly individualized. Each program piece—processing, academic, and physical—worked together toward increased brain capacity. At times Mark and Michael made huge progress in short periods, and other times they seemed to make no improvement at all. But as we persevered over the years we continued to see constant growth and significant brain change that went above and beyond what anyone ever expected. Now, at 23, they are accomplishing amazing things. At home Michael can now walk independently, but still needs a walker outside of the house. He is finishing the requirements for a high school diploma through an online program and is earning excellent grades in his classes while doing all work entirely on his own, except for some tutoring in math and typing in English. Mark has been walking without assistance since he was seven. He obtained his GED and then graduated from a local technical school with a certificate in Digital Audio Production and earned a 4.0. Currently, he is finishing an associate’s degree in general studies at Valencia College and in the fall will be transferring to the University of Central Florida to complete a bachelor’s degree. The only accommodation Mark has in college is that he is given an extra half hour during tests because it takes him longer to write his answers, and he sits in the front of the class. Even though as an infant he was diagnosed with Retinopathy of Prematurity and was considered legally blind in one eye, his vision has continued to improve throughout his life on program, and he now reads and functions very well. Mark comments that his NACD visual activities have paid off and that his vision is still improving. Both young men are incredibly independent, and thanks to their years of NACD cognitive activities, they can reason through complex problems and situations. Their high processing abilities (Michael’s auditory digit span is 10-11 and Mark’s is 11-12) have even helped overcome some of their physical weaknesses—it is easier to remember a lecture, for example, than to take notes in class. Michael and Mark also have goals for the future which include living on their own and having careers. Several years ago, they had a taste of living without mom and dad. Because they can cook and clean and have been doing their own laundry since they were twelve, spending six weeks alone at home wasn’t a problem. Mark is training to be a sports broadcaster, and Michael wants to design video games without violence, sexual content, and objectionable language. Working with the NACD has definitely been a great choice for our family. The NACD has empowered us as parents with skills, knowledge, and resources to help Michael and Mark achieve far more than what was expected of them because of their diagnosis. Our experience with the NACD has not only assisted us with our sons, but with our international missionary work as well. We have been able to use NACD’s processing activities and Simply Smarter program to help children and adults all over the world. We thank our Lord Jesus for Bob and his team for the major part they have played in our lives! *For a detailed account of the beginning of our NACD journey, please click here.